If you’re starting a social enterprise or nonprofit, you’ll naturally focus on the impact you plan to have. You’ll predict the effects of your work based on research and past successes in your field, and you’ll imagine the positive outcomes that motivate you to succeed. You’ll also, however, have to anticipate the potential negative or unexpected outcomes, and predict your ability to successfully execute the business plan and deliver your intended value. You’ll need to account for risk. Failure, unforeseen circumstances, and unintended consequences are possible in every enterprise. Acknowledging and measuring those risks — both the likelihood that they will happen, and the impact they could have — allows entrepreneurs and investors to plan ahead more safely. Entrepreneurs aiming for social and environmental impact need to consider the possibility that their work will have unintended or insufficient impact on the planet, on specific groups of people, and/or on society as a whole. 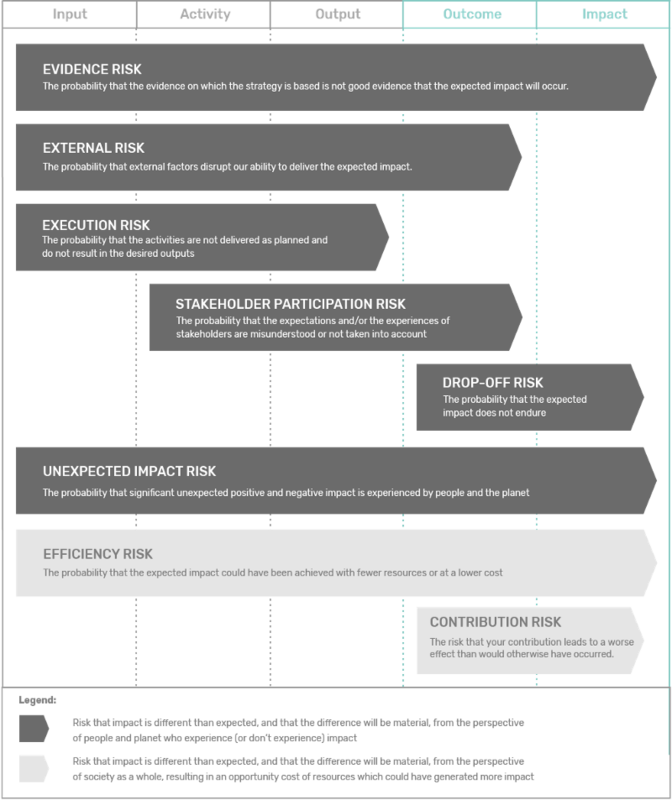 The Impact Management Project has a great resource on impact risk, including a graphic illustrating all of the ways risk can show up in an enterprise. Graphic created by the Impact Management Project. As you can see, the types and dimensions of risk break it down much more specifically than just saying, “Something could go wrong” (or naively saying, “We’re going to absolutely crush this”). For example, an ice cream shop that plans to hire and train people with barriers to employment could face typical business risks — maybe there’s an unusually cool summer that drives down ice cream sales, or a mold problem that forces them to relocate. But a social enterprise also faces specific risks related to their intended impact. The shop faces stakeholder participation risk if they put together a training curriculum without consulting people affected by the problems they’re trying to solve, resulting in a program that doesn’t effectively meet their employees’ needs. They face unexpected impact risk if they fail to account for the heavy electricity usage and carbon footprint of their industrial freezers and other equipment, leading to a negative environmental impact. By anticipating those potential outcomes, whether they are unconsidered social or environmental externalities or consequences of the ice cream shop’s operations, the entrepreneurs can proactively minimize avoidable risk and become resilient in the face of unavoidable risk. Social enterprises can look for and identify those specific types of risk as part of creating their logic models, which we discussed in our last post. As a social entrepreneur maps out their plan for using specific activities to achieve specific impacts, they can pinpoint risk at each stage and show how they will protect against it. One of Ecotone’s goals is to help our clients recognize and account for risk as part of their business models, so that they can strategically minimize or offset it.